The trek down the highway to Geelong – once upon a time this WAS the big away trip for the old VFL. For South Africa and Fiji, the distances travelled to come to the International Cup means it’s just an aside to the importance of this match up. South Africa lost first up to the Brits while Fiji reprised their 2011 Div 2 Grand Final success with a stirring win over the French. The Schools round was tough for both sides with Fiji getting thumped by the rampant New Zealand side and South Africa likewise going down to the US Revolution. The venue for this match has only this year been named the Anthony Costa Oval – home ground to St Marys footy club. Costa, brother of Frank, was an institution at St Marys, from early days playing as a junior to massively supporting the club from off the field. Anthony Costa died earlier this year. The St Marys Football Club has a proud history of interaction with South Africa. 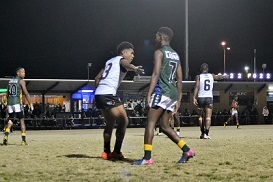 The bi-annual cultural trips – in partnership with the AFL and support from local sponsors - provides the opportunity for every boy who goes through the junior program to embark on a trip – top age U16 and first year U18 boys. The St Marys club had previously travelled to Ireland, Cape York and Weipa and 2012, 14 and 16 have been to South Africa. 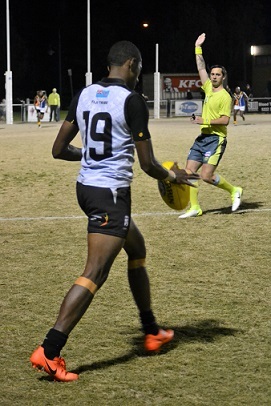 The 2016 tour included 3 games of footy against AFL South Africa U18 teams in different provinces. Amongst the crowd tonight – there were not just supporters but international mates. Winning the toss the South African skipper Tshoboko Moagi (#20) opted to kick (left of screen!!) to the Geelong city end. With no breeze the conditions were pretty well perfect. However as the game got underway, one theme for the night kicked in – many players were losing their footing. Adapting to the yellow ball under lights as well was clearly a challenge. The first term was a largely scrappy affair – the defensive pressure thwarting open play. South Africa tended to defend and transition wide – in the Malthouse style of play. Fiji looked most dangerous and the first real chance came via a mark and shot on goal by WFN’s own Dylan Wolfgramm (#15) – however the ball went behind the stick. By quarter time – it was hard to find clear winners, there were players who looked more likely – such as Vateitei (#6), Valesu (#() and skipper Navuso (#12) for Fiji while for South Africa it was largely the backline who were keeping them in the game. The third quarter was a tale of two halves – which is perhaps best reduced to eighths. Fiji looked to be starting where they left off. A set shot from Qio Nawaqatabu (#20) was touched on the line while a hurried snap from Valesu went right. Fiji now 2.5 and South Africa struggling to transition out of defence and still tending to go wide. Trying to hold back the tide – skipper Moagi was a clear standout – impressing with his left foot across half back – much in the style of the South African Luke Hodge. 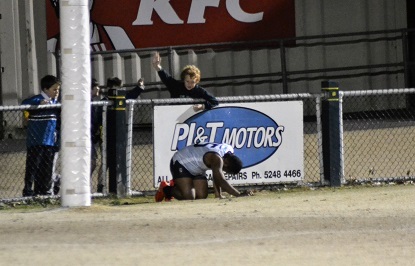 A big tackle on Vateitei drew the ‘oohs’ of the crowd in appreciation. The game was hotting up. 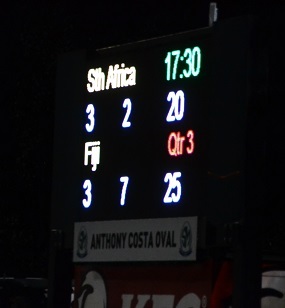 However – in the 6th minute of the term it was Fiji who looked to be about to break the game open. The breeze was picking up to the Barwon River end (the south) – and Fiji had it at their backs. 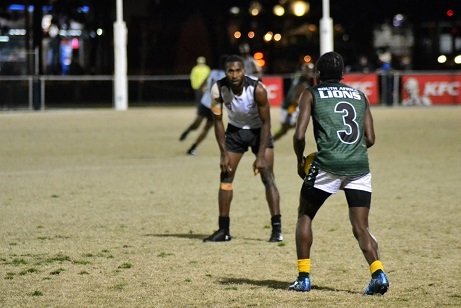 Valesu one suspects was trying to book a ride on the breeze with a long shot, tugged it left but Koroi (#26) showed the greater anticipation to lead the defenders to the ball and mark in the forward pocket. Kicking truly – the Tribe were 21 points clear and it was all one way traffic. This was the point of no return – but for the next 5 minutes it was played largely between the arcs. South Africa managed to penetrate forward and out of no where it was Banini Sekori (#8) who snapped the opportunist goal from the right forward pocket to get raise the Lions spirits. Back to 15 points. 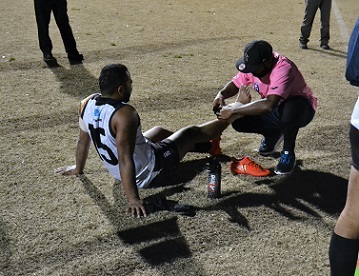 Fiji looked to respond and in perhaps a match defining moment – Wolfgramm went down near the point post – rolling an ankle. Without his presence up forward Fiji started to lose their way - with him, we were seeing perhaps the one on one battle of the night between he and Zwane (#26). The Lions had a sniff and in 5 minutes of mayhem they pulled themselves right back into the contest. 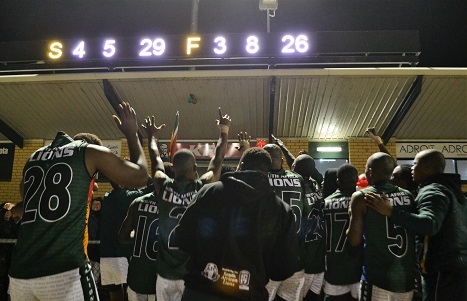 As more and more of the Lions players started holding their marks, they became more adventurous – coming back into the corridor and taking the game on. The transition of play with kicks spotting up marking targets - from Baloyi (#3) to Velele (#6), then onto Mlonyeni (#17), centred to Sokoyi (#1) and finally chipped out to the skipper – sneaking deep forward - resulted in the Lions 2nd in perhaps the play of the day. Shortly after a flying snap by Molohlanyi (#23) under extreme pressure had narrowed the margin to just 3 point – closing in on ¾ time. South Africa were most certainly B.I.T. (Back in Town). Fiji responded – as the quarter ticked to a close – an increased urgency at the contest resulted in a free to Salavou (#19). A quick chip inboard to Vateitei and as the siren sounded he would line up with a kick from the 50 – breeze blowing from his right to left – he tried to launch goalward but alas tugged it left and that was the quarter. 5 points to the good for Fiji but with the South Africans coming home with the breeze – the task was very much ahead of the Tribe to hold onto a game that had even half through that term looked close to in the bag. The last quarter was hard fought and at times wherever you looked you could find a play taking their time to lift themselves from the turf. This was too – the 3rd game for most of these players in just 6 days. Tournament play is mighty hard work. South Africa were creating the cleanest opportunities early in the term. A boundary throw-in infringement saw big Mlamli (#28) just miss from the left forward pocket (with the stands of Simmonds Stadium as the back drop). The kick in was mangled – and Lions skipper Moagi marked – kicking from about 40m out I suspected he would rubber stamp his nomination as BOG by drilling this one with his trusty left - - alas the ball slid left of the big stick. Wolfgramm was back on the ground for the Tribe – trying to have an impact – but in a wide open forward line and on one leg, the Tribe would have to be efficient and that wasn’t happening – Baloyi and Zwane (#26) were marking everything up down back and repelling but the Tribe weren’t lying down and created a chance as Wilson (#7) fired a quick snap at goal that fell just short and was forced through by the Lions backs. 4 pts to the good but still too much time. South Africa transitioned in the blink of an eye – suddenly the ball was inside 50 – rolling clear, pressure, Molohlanyi threw his boot at the bouncing ball to send it forward but it slewed off left of the behind post for a throw in. From there a rushed behind. The Tribe defending desperately – the Lions attacking but who would grasp the moment. Lungile (#22), hard on the boundary in front of the St Marys faithful – managed to find Molohlanyi who marked tremendously – but the shot from tight on the boundary didn’t connect well on the left foot and no score. 6 minutes to go – a free deep in defence to the Tribe. Could they hold out. Again – the Lions would intercept and when the chip kick back into the corridor – back into dangerous territory – paid dividends for the Lions as the skipper Moagi accepted the mark. Kicking from outside the 50 – some say as far as 75 – or at least that’s how the story was evolving in the rooms post-match – Moagi, on his trusty left foot that Luke Hodge would be proud of – connected sweetly and with the aid of the breeze the ball sailed through the middle and suddenly the Lions were in front. With just over 4 and half minutes to play jubilation was muted – there was a job to be finished. The Tribe pushed but couldn’t – the siren went with the ball on their half forward flank and that was the sign for the Lions to celebrate. Both sides had left nothing on the field and can be proud of their effort. 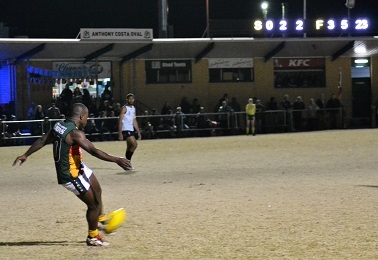 Playing night footy is something few would be accustomed to – and as a contest this was a fierce one. The Lions finally get a win on the board to join the Tribe on 1-2. 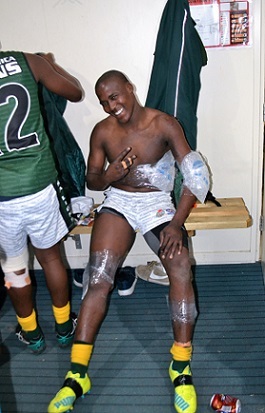 Both sides will be counting the cost – post game ice and recovery were the order of the day. Then it will be back to Royal park for Tuesdays round 4. At least they will have an extra nights recovery versus their opponents. 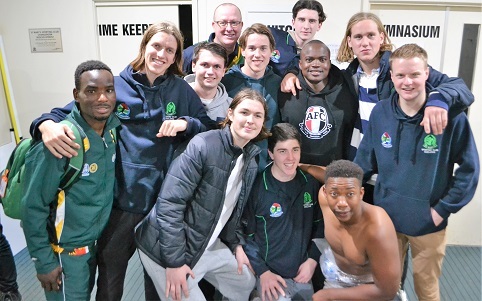 The night went off well – bringing international footy to Geelong. With the fine weather – there were wanderers by who perched themselves against the fence and watched and wondered just who these teams were. Chloe and Mia among them – having wondered over after netball – for many it is still a surprise that footy is played so broadly. The volunteers making the tournament happen are doing a great job and that includes the umpires. 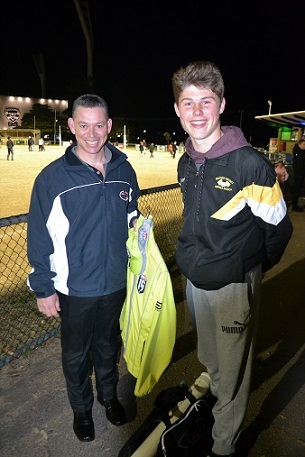 Goal umpire Jayson Killick from the Geelong region will be backing up at Box Hill North (Japan v Germany) with his goal umpiring mate Caleb Millard from Hamilton who had come down early to watch this game.